Thank you for visiting BrightStar Cherokee DoxieTribe! We are a small in-home village of show and show ancestry dachshunds. My dream for retirement was to create this long-haired dachshund clan. Please check out "Our Story" for detailed information of our journey. We’d love to hear from you any time! Please do not forget to sign our Guest Book. And, if you are seeking just the right puppy for your home, as pet or to show, you will likely find one here. Send us a smoke signal! 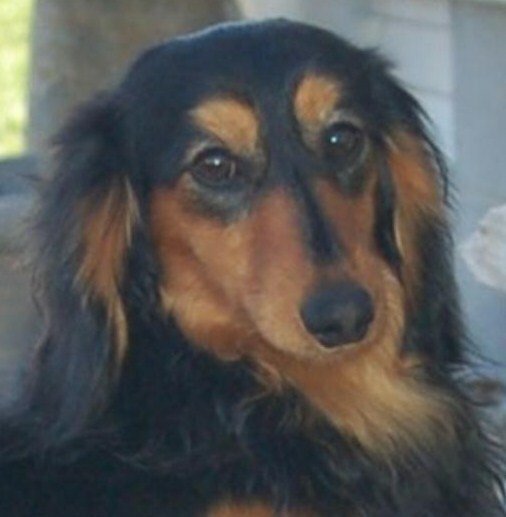 "Village of the Dreamcatching Doxie Clan"
All of today's beautiful dog breeds originally came from "Waya" ("Wolf" in Cherokee). Above: Champion Chief wins Best of Winners on his second weekend of showing, a 4-point major in Decatur, AL under Judge: Mr. David Loring Brown! 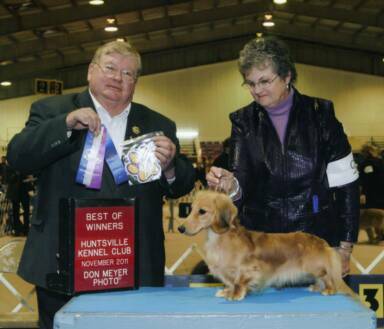 Mr. Brown is also a dachshund exhibitor and breeder, so we were very honored with the win! Thank you Judge Brown and much love to our cherished friend & handler, Kaye Atkinson. Chief was in th 12-18 month puppy class in this win. He is even more handsome today. Please see his link on the "Gentlemen" page. AKC GR CH major-pointed, "Oliver"
"SniffNTell I Repeat the Beat", our handsome Canadian import. Left: A prime example of some of the precious babies we breed. 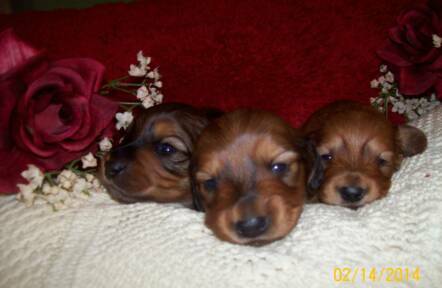 This litter was between our Luna and Rabow Dachshund's, the extraordinary CH Ehren (Burdachs Browneyed Handsome Man). Two of these boys have remained here for conformation showing, E'Dan and Clanc'E. 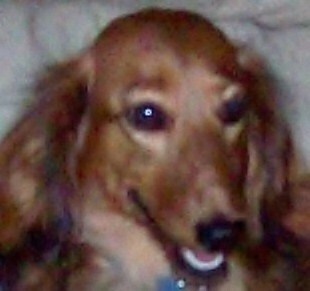 The third one, though show quality as well, E'Lan, will become a Delta Society trained therapy dog in TX. Much gratitude to my friend Melissa of Rabow's for adding these sound, historical lines to my own. Additional gratitude to Alicia Rescek for kindly sending me for the historical pictures and pedigrees of these puppies! which are linebred from her renowned breeding. Throughout this site, you will discover my love and honor for my Cherokee heritage. Click the link above to learn more .